Each committee will meet a minimum of three times through the year. This includes one meeting at June IAVAT Conference, plus two additional meetings through the school year. Meetings may be in person or teleconference. Each committee member must attend at least two meetings, verified by attendance lists sent with each committee report, to receive "X" values on the incentive funding form. Committee reports will be shared through Google Drive to the IAVAT office and the IAVAT Vice-President within two weeks of each meeting. Each committee member must be in good standing with the IAVAT. Any member not meeting committee responsibilities will be removed from the committee. The final committee report from the committee chair is due to be shared through Google Drive to the Vice -President and IAVAT Executive Director no later than May 1st. Failure to send in this report by the deadline will cause forfeiture of the X-value by all committee members. For more questions on committee work, or to serve as a member-at-large, contact each committee chair listed below. Description: The purpose of the Advocacy committee is to influence Public Policy on agriculture education through workshops and seminars. The advocacy committee is responsible for developing a productive and communicative relationship with the Illinois State Legislature, Illinois State Board of Education, and the Division of Career and Technical Education. As a committee we promote a positive relationship between all agriculture education agencies. Description: The Retention and Recruitment committee is responsible for coordinating a variety of activities that will encourage people to pursue a career in agricultural education including IAVAT Student Branch Conference. The committee is also responsible for retaining these teachers by planning events like 1-5 year teacher workshop. The committee will also be working on Quality Guidelines for teacher success. Description: The purpose of the fair & exposition committee is to aid in the development and improvement of the Fair program, assist at the Illinois State Fair during the Junior Shows and Market Lamb weigh-in, review all fair rules and guidelines, and provide voting membership and recommendations to the Illinois State Fair Advisory Committee. Description: The purpose of the member services committee is to enhance IAVAT member experience by providing unique and necessary opportunities and services. The membership services committee develops programs, manages crisis funds, and explores desired services within the organization. Description: ​The purpose of the recognition and awards committee is to recognize outstanding IAVAT members for their hard work and dedication to our profession. The committee now selects winners in all of the NAAE awards categories as well as the Excellence in Teaching awards. 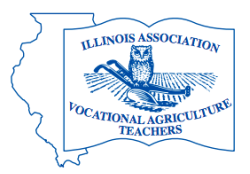 Description: The purpose of the professional development committee is to design professional development activities for the Illinois Association of Vocational Agriculture Teachers Conference, 212 Conference, District Workshops and others as needed. Description: The purpose of the SAE Advisory committee is to support teachers in promoting SAEs to their students, implement record keeping systems and evaluate current systems, provide resources to teachers, and encourage every student to have an active SAE. Description: The purpose of the Middle School committee is to develop and maintain Middle School specific initiatives for students and teachers alike. As the middle school model is developed and created the committee will serve to identify appropriate and responsible program components to successfully sustain Middle School development in Illinois. To view the current committee lists, view the google folder for the committee in question. Report any inaccuracies to the appropriate committee chair.